In the spirit of Nutrition Month, we listed the three healthiest diets on earth and the top 10 healthiest countries on Bloomberg’s Global Health Index along with their national dishes. The Mediterranean diet—covering countries like Spain, Greece, and Italy—is oft-mentioned as the healthiest one in the world due to its high proportion of fresh fruits and vegetables. Aside from fresh fruits such as grapes and berries, the Mediterranean diet is centered in leafy vegetables, legumes, whole grains, fresh herbs, and nuts. Fish and poultry are the popular meat choice while the major source of fats is olive oil. This diet also includes dairy products and red wine, but avoids pork and sweets. What makes this diet healthy? The Mediterranean diet has a great combination of healthy foods. Olive Oil is good for you, too—it’s a great source of “good” cholesterol, which fights the bad kind and aids the heart. According to a recent study by the Lancet Global Health, the West African diet—the one followed in Ghana, Nigeria, Mali, and Chad—is a lot healthier than the British and American diet. The study shows that the West African diet is rich in fiber and omega-3 while low in sugar, sodium, and processed meats. It also ranks the highest in consumption of whole grains, fresh fruits, and vegetables in proportion to junk and processed foods. While covering a diverse selection of foods, a typical West African diet would include whole grain, fish, Jollof rice, vegetables, and root crops like yams. Foods with high dietary fibre are your number one choice for good bowel health, while helping you control your body’s sugar level. West African food is good for the heart as well because it has Omega-3 fatty acids which lowers bad cholesterol. Japanese people have the highest life expectancy in the world, a testament to their healthy eating. The Japanese diet usually includes a bowl of rice, freshly-caught fish, lots of vegetables, and soy sauce for seasoning. The Japanese diet proves that a daily serving of rice is actually good for your health as it can create a sense of fullness, preventing you from overeating. Also, the main source of nutrients in a Japanese diet comes from steamed fresh vegetables mixed with a flavorful broth. A good dose of soy products like edamame beans, soy sauce, and tofu give you the best protein source alternative to red meat. While there are a number of health indices, this article focuses on Bloomberg’s most recent Global Health Index. The think tank ranked 163 countries based on variables such as mortality rate, health risks, life expectancy, and environmental factors. Luxembourgian cuisine is a celebration of European flavors, embracing the cultures of Belgium, Spain, France, and Germany. When it comes to their most popular and iconic dish, all sources point to “Judd mat Gaardebounden” or "Smoked Pork Collar with Broad Beans." It’s a pork dish served with boiled potatoes and wine. Like Luxembourg, Israeli diet is also a mix of international flavors. The country’s cuisine has major influences from Turkish, Arab, and Persian countries. One of Israel’s many traditional dishes is Shakshuka—a mixture of sautéed vegetables and eggs poached in tomato sauce. The core of this dish is fresh plum tomato which is rich in Lycopene, a cancer-preventative carotenoid. The protein-rich eggs add texture and creaminess, while its herbs and spices make it very flavorful. Husmanskost or Swedish home cooking typically centers on using locally available produce. This includes pork, seafood, and dairy products. Meatballs, in particular, have a special place in every Swedish table. There's no definitive style of cooking this popular dish. Some prefer it served with thick gravy, while others only with thin meat sauce. The Northern Swedish recipe prefers less meat while the Southern recipe prefers to have it the other way around. Sushi is perhaps the most popular Japanese food in the world. The dish is high in protein, while salmon and tuna are sources of omega-3 fatty acids. Make sure to eat the right kind of sushi, however, as not all are made equal. Paella represents the diverse and rich culture of Spain. The dish is a melting pot of flavor, composed of rice, meat, and seafood made more flavorful by choice herbs and spices. DID YOU KNOW? 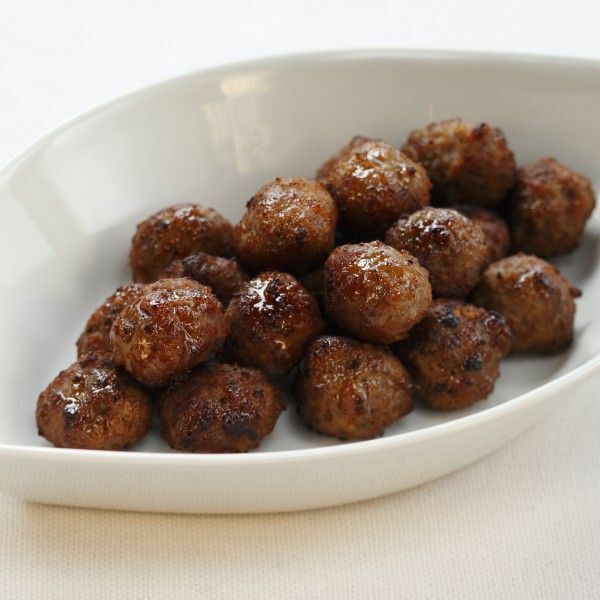 Sweden’s next-door neighbors in Scandinavia all have their own meatball dishes. Denmark in particular is home to the savory and slightly flattened frikadeller. Here’s a turkey-based recipe that you can whip up in just 40 minutes! Based on a poll by News Ltd, roast lamb was crowned "Australia's National Dish”, earning a quarter of all votes. The lamb is roasted slowly to let spices and herbs blend with the meat. This popular Singaporean meal is part of CNN’s World's 50 Best Foods. Its preparation is pretty straightforward—rice cooked in chicken stock topped with savory chicken cuts, served with spicy chili sauce. Its origin is mostly associated with the immigrants from Hainan province who introduced Wenchang Chicken to Singaporeans. The latter appropriated their own flavor to the dish, resulting in what we now know as Hainanese Chicken Rice. While Cheese Fondue is perhaps the most iconic Swiss food, the seats for Switzerland's national dish is reserved for Rösti and Zurchergeschnetzeltes. Rösti is a fried (or baked) potato patty mixed with onion, bacon, and cheese. It’s often a side dish to Zurchergeschnetzeltes—veal cooked in wine and cream. Definitely not for the weak stomach, Iceland's most iconic dish is Hakarl or fermented shark meat. The word hakarl means shark's carcass. It’s an Icelandic delicacy known for its rancid smell, and is often called “the worst tasting food” by foreigners. A contender for Iceland’s national dish is grilled lamb, which is surprisingly rich in nutrients. Italian cuisine is known for dishes like pasta, pizza, and risotto, all of which are loved everywhere in the world. Italians use healthy and natural ingredients for their food, perhaps a factor in them landing the number one spot on the global health index. Get authentic italian pizza recipe here. Did you find this article informative? What do you think is the healthiest diet to follow? Share your thoughts by leaving a comment below.